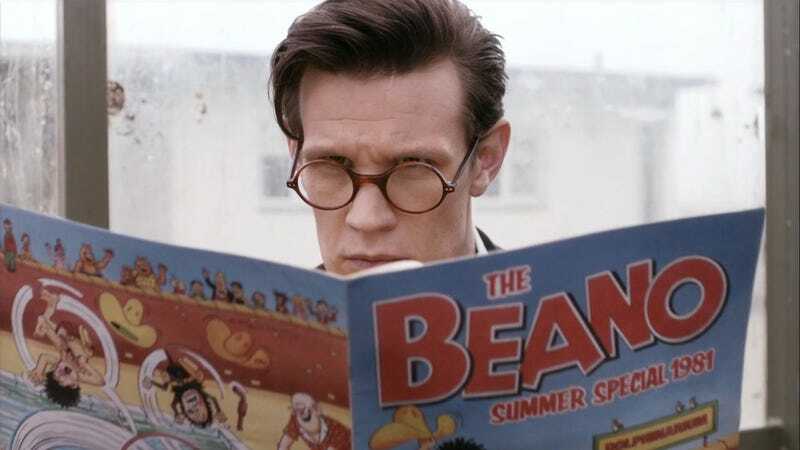 You might recall the Doctor Who trailer creating a little bit of wonder as Doc 13 swapped Graham’s newspaper for a Beano Summer Special which had previously appeared during Matt Smith’s run as the Time Lord. If you don’t live on Starship UK, or you are not Mark Hamill or Paul Rudd, you might not be familiar with DC Thomson’s flagship comic, The Beano which celebrates 80 years of publication this week. It’s the longest running weekly comic in the world! There have been 3,945 issues plus annuals, specials, and digests, etc. The name is a printers term for a party. Mark Millar still has his badges. Honest! The first issue of The Beano launched in July 1938 with a free mask and introduced a host of iconic characters. It was a sister publication to The Dandy and Magic. The cover star back then was Big Eggo, a talking ostrich who sometimes had hands and would go on to punch out Hitler within a couple of years. His co-stars Lord Snooty and Pansy Potter were fond of a spot of Nazi bashing as well. Big Eggo coincidentally, inspired the super computer Big Ego in Michael Moorcock’s The Final Programme. Anyway, The Beano grew into a force to be reckoned with, it’s inherent anarchy becoming a national institution. Big Eggo was eventually replaced on the cover by Biffo the Bear. The Beano’s position was reinforced in 1951, issue 452, when they introduced Dennis the Menace, a savage little oik who pips the cute Ketcham kid to the starting line by about a week. It’s an amazing bit of coincidence though. David Law and Hank Ketcham worked on developing their respective characters in isolation and the obvious transatlantic divide. Our Menace would later depose Biffo as cover feature and has been there ever since. These days he sometimes gets a bit of competition from Minnie the Minx and The Bash Street Kids. Back in the day they used to mix the humour with light adventure yarns, which could be gripping, surreal and fun. If you read the Alan Moore-Alan Davis Captain Britain and wondered where you could read the adventures of Colonel Tusker before he was slaughtered by the Fury, well The Beano was the place to go. General Jumbo, variously drawn by Paddy Brennan and Sandy Calder told of a schoolboy with a radio controlled toy army that could be tasked to solve any problem or defeat any foe. The comic also had its own daredevil superhero, Billy the Cat, high tech marine explorers the Iron Fish, cycling vigilantes, The Q-Bikes, or super-villains such as Professor Zoom. There were other tales and characters, some whimsical, others less so. It’s a style of comic that went out of fashion, never sure why but more’s the shame. They should have a modern counterpart. Back in the Fifties, sales hit 2,000,000 a week. I’ve heard higher in the past and although The Beano falls short of that in the 21st century they have been enjoying a renaissance of sorts with sales rising year-on-year. All strength to them. Dennis and Gnasher have a new cgi animated tv show. Minnie the Minx is being developed as a live-action series. Hey, they are even talking about a Bananaman revival. The latest issue has been “guest-edited” by Little Britain’s David Walliams for a prank filled special. You can learn how to make an eggy pong if you haven’t already. Here’s to the next eighty years. Today The Beano celebrates its 80th anniversary. Being a smartarse, I got 12/12 on the Mirror quiz. Read the comic where Dennis and Gnasher meet for the very first time!